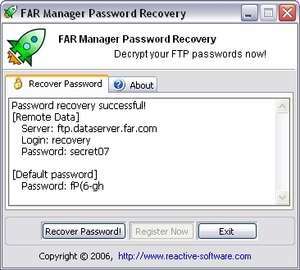 FAR Manager Password Recovery is a software download that instantly recovers and decrypts account information including passwords for all FTP sites that have been added in FAR Manager. Default password is also recovered. All versions of FAR Manager are supported. For security reasons, you should also check out the FAR Manager Password Recovery download at LO4D.com which includes virus and malware tests. Additional screenshots of this application download may be available, too.